Since the inception of email, texting and other forms of instant communications letter and post card writing are disappearing, One would wonder how historians will document the Afghan War when they will not have access to the thousands if not millions of emails that have passed between the service men and women and their families back home. A hundred years ago during WW1 pen and paper were the primary means of servicemen communicating with their loved ones back home. The postcard industry printed thousands of cards so that a serviceman could quickly send off a note to loved ones for the price of a Two-Cent stamp. Often times the postcards were simply messages designed to boost morale or encourage the people back home “to do their bit” for the boys overseas. That is the case with the postcard below. 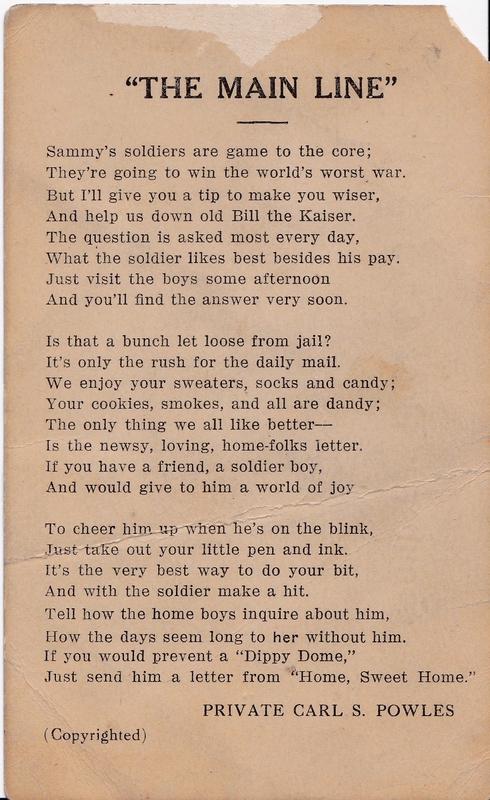 It’s a poem (perhaps not a very good one) that conveys to the people back home that the one thing the serviceman wants most is mail from home. The poem is by Private Carl S. Powles. An INET search for the private’s name failed to turn up a link. The term “Dippy Dome” is a bit of a puzzlement. As far as I can tell the phrase does not have any current meaning. In the context of the poem “Dippy Dome” suggests a sad soldier who needs mail. The phrase appears be WW1 slang that has now lost meaning. The other side of the card is blank except for the title, “Souvenir Post Card” and along one edge the name, David F. Hetzel. I did a quick INET search for the name and found a David F. Hetzel mentioned as one of the siblings of Henry C. Hetzel of Racine County, WI. Since the postcard was purchased by me in a near-by county it is likely that David was the owner of the postcard. David is also mentioned as a merchant of Racine. According to Henry Hetzel’s online bio the family came from Germany. This is not at all unusual for SE Wisconsin. Many of the sons of German immigrants fought against their kinsmen in WW1 once America entered the war.